What is absorption air conditioning? Compared to the vapor compression systems that uses mechanical energy to function, the absorption air conditioning is driven by heat energy. It uses a chemical process to change low temperature and low pressure vapor into high pressure vapor. The commonly used refrigerant in this system is water and ammonia or lithium bromide. The heat source that can be used are steam, natural gas, liquefied petroleum, kerosene, solar heated water, geothermal heated water or resistance heating that utilizes electricity. The use of natural gas is the most common source of energy and the system that uses this is known as gas-fired cooling or gas-fired heat pump. One main advantage of this system is that it can be used in remote places or houses even when there is no source of electrical power supply. Many recreational vehicles use the same principles for their refrigeration need. This system used to be available only in commercial buildings but these days, large homes can also install it. The vapor compression system uses mechanical energy for its operation. 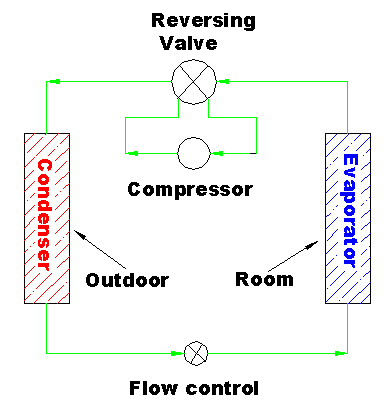 The evaporator and condenser used are similar to those of the compression system. 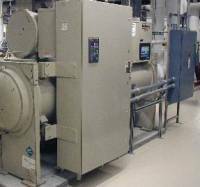 However, the compressor is replaced by a generator, pump and an absorber. The heat source will cause the vapor refrigerant in lithium bromide solution to boil and increases in pressure. The high pressure vapor results in higher condensing temperature. Condensation of the vapor happens at higher temperature and pressure compared to the surrounding temperature. As the condensing temperature is higher than the ambient, the heat is transferred from the condenser to the surrounding and hence removed. The liquid which is under high pressure state is forced to go through a valve where its pressure drops. This drop in pressure also causes the boiling point temperature to drop. It is then passed through an evaporator where it is boiled at a lower temperature and pressure. The liquid absorb the heat from the conditioned air and causes the liquid to boil. In this way, the air is cooled and discharged to the room. The vapor is then directed to the absorber where it becomes liquid lithium bromide solution. This solution is then pumped back by the pump into the generator. The lithium bromide which is also called the absorbent is separated from the water by the use of heat. Water vapor goes into the condenser and the lithium bromide goes to the absorber. This is repeated all the time hence providing cooling to the room. The use of absorption system in HVAC is increasing as it has lower operating costs. It is also less harmful to the ozone layer as no CFCs gases are used. In places where there are no electricity supply, this system works well on natural gas or solar energy. It is also quiet as there is not any mechanical compression used during the cooling process. Most of the systems are equipped with service valves for maintenance works. Get qualified technicians to service the unit as the chemical used such as ammonia is toxic and flammable when mixed with air. Ammonia and lithium bromide are also highly corrosive and reacts with some metals. The tubing and fittings used should be made of steel or aluminium.